Nadi Shodhana (nāḍī-śodhana) is a type of prāṇāyāma. Put simply, it is a type of breathing practice where airflow is controlled through alternate nostrils to bring a practitioner toward a subtle sensation of internal balance. Nadi Shodhana is a Sanskrit term which means "cleansing or purifying the channels." Understanding this, we can visualize the breath and each breath cycle as purified and purifying: On a deep inhalation, imagine the breath as cleansing out all body systems by flooding every vessel with fresh oxygen. With a complete exhalation, visualize expelling carbon dioxide, clearing out all stale life-force energy, making room for fresh prāṇa. Nadi Shodhana works to balance the flow of prāṇa, or subtle life-giving energy experienced most directly via the breath. Through this practice, a sense of balance is restored between the left and the right nostrils which are associated with the dual hemispheres of the brain. Because of this focus on breathing through either the right or left nostril, Nadi Shodhana is widely known as "alternate nostril breathing." In the traditional science of Ayurveda, right and left nostrils are associated with the a pair of opposites that represent the dual tendencies of nature (right and left side, inhale and exhale, active and passive, masculine and feminine, solar and lunar, giving and receiving etc..). Achieving this balance and union of opposites is experienced as harmony between and within the body and mind. As the breath becomes calm, the mind becomes clear. When we experience balance, any sense of agitation settles. Withdrawing from the senses, observing the breath, we can focus on the internal vibration of prāṇa flowing through the body. Concentration on the flow of prāṇa can induce a calm meditative state, preparing the body for more extensive practices of prāṇāyāma. tubular vessel or cord; a vein-like channel or network of streams. clearing up, discharging, refining, removing or cleansing away. the act of keeping in order. So we can think of nāḍī-śodhana-prāṇāyāma as "the control of the breath which keeps our inner network in order" or "the expansion of prāṇa which clears up our energy channels" or even "the breathing exercise which purifies the vessels." When we understand the Sanskrit root of the term, we can imagine the practice from a powerful perspective, using our power of visualization. Technique was used by our girl Hilary Clinton to get her through the stress and anxiety of the 2016 presidential election. Practice this technique if you are struggling to settle into your body before meditation. This practice has been shown to facilitate communicating across hemispheres of the brain. It will calm the body and increase mental focus, bringing the mind to meet the present moment. It balances the flow of prana through the subtle energy channels and physically regulates airflow through the right and left nostril. Experience an increase in efficiency of circulatory and respiratory functions. bring awareness to the breath as-it-is. Notice the current state of the breath. observe which nostril is pre-dominanty drawing in the breath. This is the "dominant nāḍī" at the moment. LEFT CHANNEL: Iḍa Nāḍī; relates to the left nostril, the right side of the brain, and the parasympathetic nervous system. It is associated with qualities of calm, cool, lunar energy. CENTRA CHANNEL: Sushumna Nāḍī; relates to the spinal canal and central nervous system. RIGHT CHANNEL: Piṅgāla Nāḍī; relates to the right nostril, the left side of the brain, and sympathetic nervous system. It is associated with qualities of hot, active, solar energy. cale vāte calaṃ cittaṃ niścale niścalaṃ bhavet -Haṭhayogapradīpikā 2. 2. "When the vital wind is disturbed, the mind will be disturbed. When the breath is steady, the mind will be steady." The left side represents lunar energy. 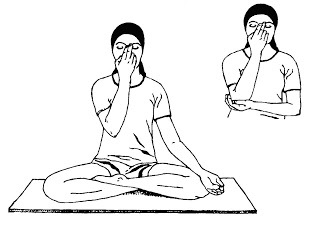 Beginning and ending alternate nostril breathing with the left side stimulates the iḍa nāḍī and brings a cooling quality. Focusing on breathing through the left nostril can bring a sense of calm to the mind. This breathing is said to regulate "hot" emotions such as anger or frustration. It can induce a sense of relaxed awareness and has been clinically shown to decrease sympathetic activity of the nervous system with increased sympatholytic/ parasympathomimetic effects. The right side represents solar energy. Leading and closing with the right nostril stimulates the piṅgala nāḍī and brings a warming quality. Focusing on breathing through the right nostril can help increase energy, enhance focused concentration, and bring the mind and body into a state of alert awareness. Right nostril breathing is also said to promote digestion. Studies have shown the sympathomimetic effects of right nostril initiated nadi shodhana practices. MIND: How are your thoughts? However they arrive, set an intention to focus completely on the breathing practice. BODY: The spine is neutral with the back of the head in-line with the sacrum, shoulders held directly above the hips. The gaze is at the horizon line, eyes straight ahead. The ears are level, the front of the chest is open. The seat feels rooted. BREATH: How is the breath? Tune into the breath for a moment. Remain focused completely on the breath, turning attention away from the mind and the body. * Use 10-15 breaths to settle your attention in preparation for the prāṇāyāma practice. Rest the pointer and middle fingers of the right hand on the "third eye" at the center of the forehead between the eyebrows. The right thumb will regulate airflow coming into the right nostril while the ring finger will be used to close the left nostril. The pinky remains relaxed. For this breathing practice, you will regulate the flow of oxygen as it passes through the nostrils by closing off alternate nostrils using the hasta mudrā detailed above. Begin with a full exhale through both nostrils. Using gentle pressure, place the thumb of the right hand on right side of the nose to close of the right nostril. Then, with the right nostril closed, inhale fully through the left nostril. At the top of the inhale, close off the left nostril with the right ring finger. Pause for a moment with both nostrils closed off before releasing the thumb from the right nostril to exhale through the right side. Pause for a moment between each inhale and exhale as you continue alternating the flow of oxygen. Continue the practice for a minimum of 5-9 rounds, working up to 12-18 rounds. Finish the practice with an exhale out through the left nostril. Close the eyes for a moment and bring awareness back to the breath: Breathe in and out as evenly as possible through both nostrils. Take several moments to notice any sensations, Notice the breath and the body. Notice the mind. Through the oscillation of airflow, we can observe rhythmic changes through the body and the mind. Use the breath to gently observe and facilitate the movement of prana through the central channel. Intend to equalize the length of the inhalation and the exhalation working with a 1:1 ratio. Keep a calm demeanor through out the practice and approach with gentleness... refrain from forcing the breath past a place of comfort. Keep the chest lifted, the spine long and the shoulders relaxed. Count the breath without hurrying. If your nasal passages are obstructed, clogged or blocked, do not perform this exercise. Otherwise, it can be practiced daily. Yoga breathing through a particular nostril is associated with contralateral event-related potential changes. Changes in P300 following alternate nostril yoga breathing and breath awareness. Immediate effects of right and left nostril breathing on verbal and spatial scores. Effect of alternate nostril breathing exercise on cardiorespiratory functions. Immediate effect of chandra nadi pranayama (left unilateral forced nostril breathing) on cardiovascular parameters in hypertensive patients.